El Paso County / Community Services / Great American Clean Up! The Great American Cleanup, which marks its 21st year in 2019, engages more than 3.4 million volunteers and participants, on average, every year to create a positive and lasting impact. 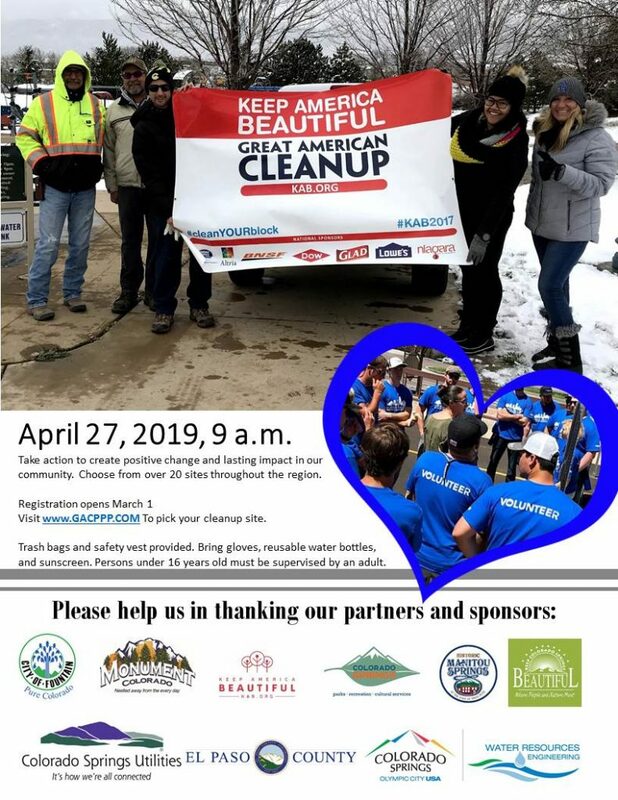 The Great American Cleanup / Pikes Peak Partners is a coalition consisting of the City of Colorado Springs, Colorado Springs Utilities, El Paso County, the City of Fountain, Keep Colorado Springs Beautiful, The City of Manitou Springs, the Town of Monument, and UpaDowna. In 2018, over 400 volunteers collected refuse at local parks, trails, creeks, roads, and town centers. We are encouraging civic organizations, churches, scout groups, school groups, and individuals to participate in 2019 as we give the Pikes Peak region a “spring cleaning”!